My heart just stopped. No, I don't need an adrenaline shot or a tampon quick-fix...I need Army of Two: The 40th Day. Like, right now. The Army of Two Developer Blog has been updating like crazy, including some juicy updates that we've missed despite our obvious excitement for this game. Spenser Norrish, the community manager and a very helpful friend to Co-Optimus, has been steering us toward the blog for some time. After promising to feature the blog in a news post this week, the "Extraction" reveal trailer has been made available on the blog, and their timing couldn't be better. Not only is Army of Two: The 40th Day jumping on the "survival mode" bandwagon, it's doing so with its customizable armor and weapon features intact. Pre-order demos and exclusive content? Pft. Try instant access to the game's free delayed-release bonus (read: DLC) four-player co-op survival mode! UPDATE 2 - The full press release says that this mode will be "unlocked", which smacks of on-disc content being withheld, a laResident Evil 5's Mercenaries mode. If that's the case, I mistakenly used the term "DLC". Consider me wary. "Extraction" will be available to everyone 30 days after launch (which is scheduled for January 12, 2010 in the U.S., by the way), so don't fret if you're not a pre-order fan or if you prefer to buy games used. You'll still get in on the action, although price - if any - has not been discussed. If you are planning to pick up the game on launch day, however, reserving your copy will grant you "Extraction" access on January 12th. This new mode comes in addition to two team-based multiplayer modes and Co-Op Deathmatch, which determines the winning team by scoring co-op partners (as opposed to strictly kill counts). An exciting new trailer has been made available at the dev blog. 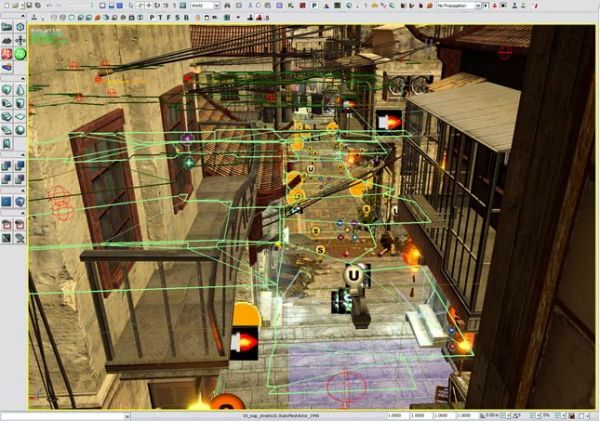 This is a screenshot of the AI editor currently being used by EA Montreal to make sure that enemy and partner AI ("partner AI"? What's that?) will mesh with gameplay in a way that is less frustrating and more coherent than before. A very detailed write-up by Spenser is available at the October 11th posting. And for those of you still intrigued by the morality system that will no doubt cause many laughs and tears, an interview and "Choices" trailer is available on the dev blog at the October 9th posting.